Vero Beach: Dodgertown or ‘Teestown? Damien Magnifico’s first pitch in tomorrow’s Jackie Robinson Celebration Game at Vero Beach will etch the Brevard County Manatees and Lakeland Flying Tigers into the renowned history of Holman Stadium. Magnifico, however, will not be the first Manatees hurler to toss an historic pitch at the Dodgers’ long-time spring training home. Historic Dodgertown has missed professional baseball. After enjoying Dodgers spring training from 1948-2008, Holman Stadium has not hosted a professional baseball game for six years. The last spring training game in Vero Beach was March 17, 2008 and the final pitch thrown in a Dodgers uniform was delivered by former Manatees left-hander Mike Myers. Myers, who made three appearances for Brevard County in the team’s 1994 inaugural season, signed a minor league contract with the Dodgers in January, 2008 and was invited to spring training. The submarine-hurling southpaw made 11 appearances for Los Angeles that spring, including a relief outing against the Houston Astros in the team’s farewell to Dodgertown. Los Angeles trailed 12-10 in the ninth, following a go-ahead two-run homer by DH Nick Gorneault. With two outs, Dodgers Manager Tommy Lasorda – who was managing the team for a week while Joe Torre took a split squad to China – called on Myers to face Houston LF David Newhan. Myers, a left-handed specialist during most of his 13-year Major League career, struck out Newhan to end the ninth inning. Houston’s Carlos Hines set the Dodgers down in the bottom half of the inning, thus making Myers the final Dodger to pitch at Holman Stadium. Though the Dodgers played their final spring training game at Holman Stadium in March of 2008, professional baseball remained at the complex through that summer with Tampa Bay’s Class-A Advanced affiliate, the Vero Beach Devil Rays. Brevard County won its last game on the historic grounds on August 7. Future Major Leaguers Jonathan Lucroy and Mel Stocker hit home runs for the Manatees in a 6-3 victory. Another former big leaguer, Mike McClendon, earned the save. The ‘Tees went 11-7 in the 2008 season series against Vero Beach, including a three-game sweep in their final visit to Holman Stadium. One year earlier, current Manatees coach Ned Yost IV played five games at Historic Dodgertown. Then a first baseman for the ‘Tees, Yost went 4-for-8 with three RBI at Vero Beach. The Manatee with the closest ties to Vero Beach, however, is Brevard County first base coach Reggie Williams. 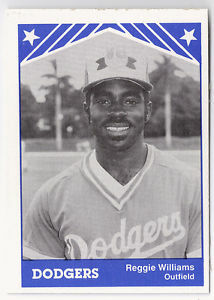 From 1982-87, Williams called Holman Stadium his spring training home as a member of the Dodgers organization. Williams also played two seasons with the Dodgers’ Florida State League affiliate in Vero Beach. In 1983, Williams stole 47 bases in 81 games for the Vero Beach Dodgers. The outfielder played one more season in Vero before making his Major League debut in 1985.